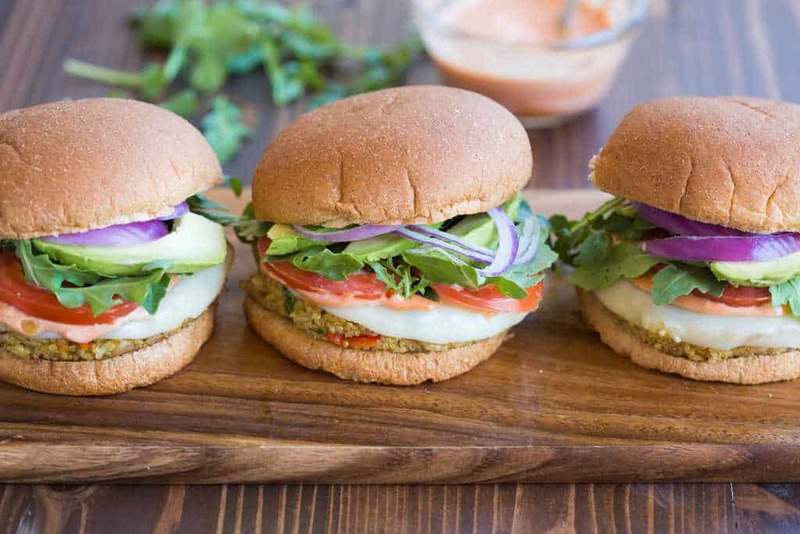 These super filling, protein-packed quinoa veggie burgers are for EVERYBODY! My entire family loves them! Made with quinoa and brown rice, and easily adaptable to mix in your favorite veggies. First, My twin sister was my date! She flew in town with my sweet little nephew and we had a blast! Second, we saw it at the Dine-In Theatre by my house. I’ve become a total movie snob when it comes to theatre-viewing, thanks to this one. There’s nothing like those awesome recliner chairs, and a waiter that brings you food and drinks during the movie. Amazing. We saw a yummy quinoa veggie burger on the menu, so we decided to give it a try. I really didn’t expect much at the time–it’s not like movie theatre food is very impressive–and we were mostly just trying to choose something that wasn’t a million calories. Then BAM: my first bite happened. Instant LOVE. Seriously one of the best veggie burgers I’ve tasted. I was so surprised, and pleased. DAAANG that burger was good. After some trial and error I came up with this beautiful recipe. A lot of quinoa, a little bit of brown rice (love the texture it adds! ), chopped spinach and red bell pepper, eggs, panko bread crumbs and some spices. This burger is pretty easy to adapt. If you don’t have spinach or red bell pepper you could leave them out, or try another diced veggie. You could also substitute the panko bread crumbs for rolled oats. And let’s not forget that half the yumminess of the burger is the toppings. Must. have. awesome toppings. The fresh arugula is crucial, in my opinion. I also added tomatoes, avocado, and red onion. OH ya! Then, go crazy with your favorite sauce! I love to spoon on a good sriracha mayo, or homemade chick-fil-a sauce. You could also just go for traditional ketchup/mayo or BBQ sauce, if that’s your thang ;-). Just make it sauce-y, because everything is better with sauce! 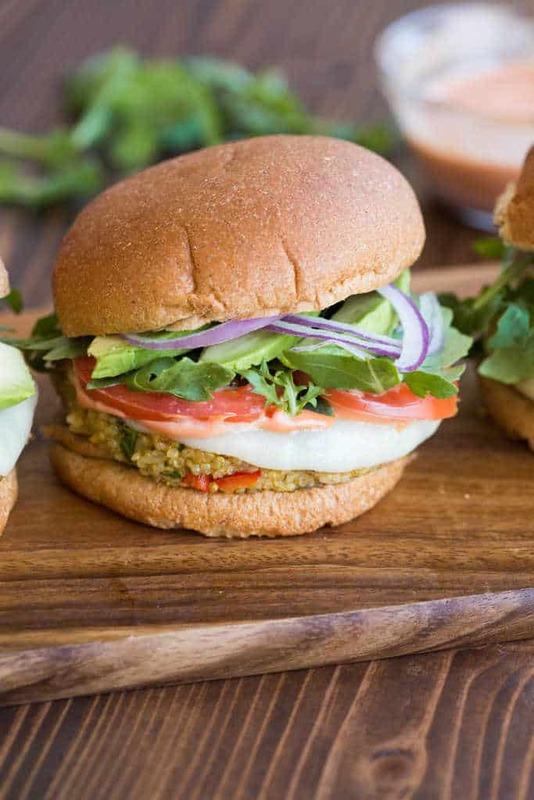 Then go ahead and enjoy some quinoa burger heaven. 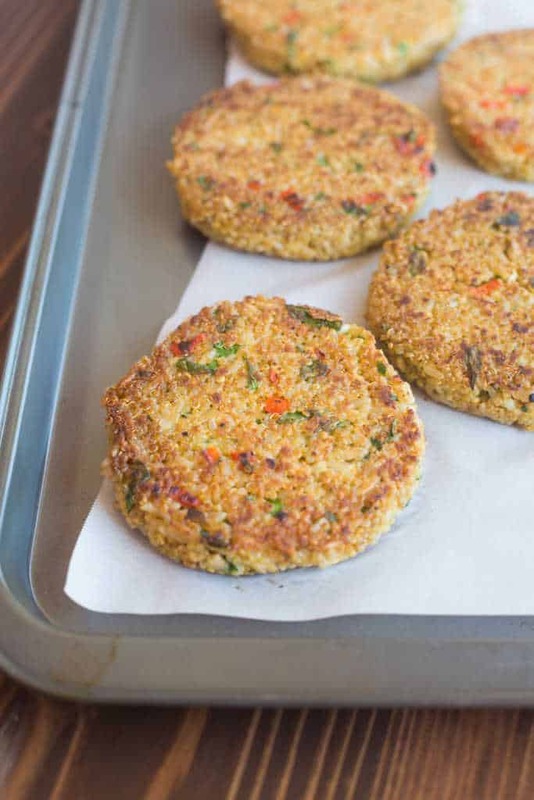 These super filling, protein-packed quinoa veggie burgers are made with quinoa and brown rice, and easily adaptable to mix in your favorite veggies. Add all burger ingredients to a large mixing bowl and stir very well to combine. Taste and add a little more salt and pepper, or other spices, to your liking, if needed. Line a large tray with parchment paper. Spoon burger mixture into a 1/2 cup measuring cup and pack it in with the back of a spoon. Invert mixture onto parchment paper. Use your hands to gently press down and mold the sides of the mixture to form a patty. Repeat with remaining mixture—it should make about 5 patties. Heat a large skillet over medium heat. Add a little oil to the pan, or spray really well with non-stick cooking spray. Once hot, add patties. Cook for 3-4 minutes or until crisp and golden on the bottom. Very carefully flip them to the other side and cook for an additional 3-4 minutes or until golden brown on that side. Serve burgers on a whole wheat bun or lettuce wrap. Top with provolone cheese, arugula, tomato, avocado, onion, and desired sauce. We LOVED these!! They held together so well and the texture was phenomenal. Absolutely delicious!! I doubled the batch and now we have a bunch in the freezer for easy lunches!! I’m excited to find a veggie burger that doesn’t have beans! I’d like to make a batch and freeze some. Should I cook them before freezing? Hi Michele, I think you could do it either way (cooked or uncooked). Freeze them cooked if you want a quicker prep time later. If they’re uncooked you’d probably want to thaw them in the fridge overnight before cooking them. Oh my gosh! Loved these. This was my first try making veggie burgers without beans, and I have no regrets. This was the perfect level of crunchy on the outside, textured on the inside, and a pack of flavor. I can’t wait to make them again and experiment with different vegetables and toppings! Is there a variation where you don’t use brown rice? can you make them without rice at all only with quinoa? Sure, you could try replacing the rice with quinoa, or mashed beans. Hi Lauren, Have try this recipe before, we love it. I don’t have spinach and don’t want to go buy some. What can I substitute for the spinach. Thanks for a great recipe. So Good. Hi Debra, I think you’d be fine to just leave it out 🙂 I’m so happy you’ve enjoyed them! LOVE these!!! I’ve made them several times for my very picky family, and it’s a hit every time! I would love to have the recipe for the sauce you use on them…I have a feeling it’s better than what I’m doing. lol! Thanks for always making my life easier with your recipes!! You’re the best, thanks so much! 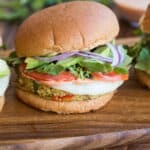 Am so excited to find and try your veggie burger recipe. Don’t want to go to store as its super cold out. 1/4 c short of quinoa? Also have yellow pepper and oil packed sun dried tomatoes, which I thought I’d add. Please reply ASAP so I can start making these awesome looking burgers!